Learning how to swim breaststroke one part at a time is the best way to get an overall smooth swimming stroke. Break the stroke down into its separate parts, learn and perfect those parts and then piece the whole stroke back together. Learn the leg kick, then the arm pull and discover how to integrate the breathing technique. Available from Amazon and most other online retailers. Click here to instantly download a free sample. Why do I get so out of breath swimming breaststroke? Why do I slowly sink when I swim? How can I swim longer distances with less effort? 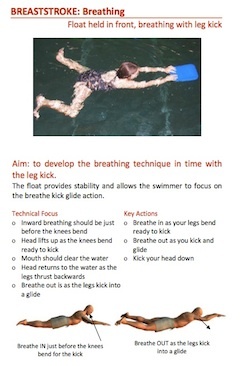 Always wanted to learn how to swim breaststroke? Do you find basic breaststroke technique difficult?